Home / Anthony Weiner / Brooklyn / Brooklyn GOP / Brooklyn GOP Radio / Buffoon of the Year / Carlos Danger / Fun / Glenn Nocera / People's Republic of New York / Republicans For Change / The Nocera Tapes / BEHOLD! Your 2013 Buffoons Of The Year! BEHOLD! 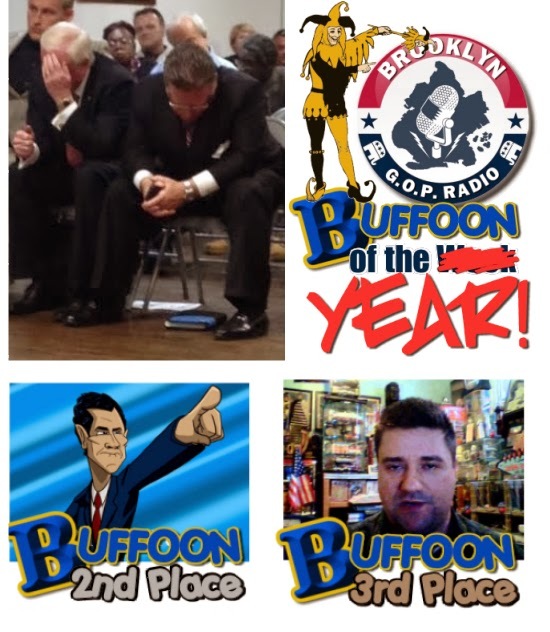 Your 2013 Buffoons Of The Year! 2013 Buffoon of the Year - Republicans For Change! 2nd Place Buffoon - Carlos Danger! 3rd Place Buffoon - Glenn Nocera! Thanks to everyone that voted (including our fans who voted via overseas proxies over and over and over again!). You made this the most fun BOTY we've ever done. OK, 2014 - you have a high bar set for you... WHAT YOU GOT!